We say we live by the Bible’s precepts… this is admirable. If we’re honest though, we also recognize that we don’t really do everything that the Bible prescribes. For sake of brevity, consider the words of Paul regarding women in his first letter to the Corinthians, “But every woman who has her head uncovered while praying or prophesying disgraces her head, for she is one and the same as the woman whose head is shaved (11:5).” For the most of us, we will not be seeing our women’s heads scarfed. Many will explain these and so many more things we no longer practice away with the term ‘cultural,’ or as Mr. McKnight shares, “That was then, this is now.” What will bring us massive headaches though is how do we distinguish between what was merely a culturally accepted thing during biblical times and what must be preserved forever? First, in speaking for the author of this book, the gospel never changes. Yet, the gospel of Jesus Christ is timeless and without boundaries, able to thrive in any culture, which is why Paul could become all things to all men so he might save some. Once it is ensured an authentic gospel is left intact, the author then identifies something unique about the Bible and its complete story; cultural changes are okay. He explains it this way. God spoke in Moses’ days in Moses’ ways. God spoke in Jesus’ days in Jesus’ ways. God spoke in Paul’s days in Paul’s ways. God speaks in our days in our ways. The author of this book is of the firm belief that we can read the Bible rightly by immersing ourselves into the times of its writing, but then returning to the present with a principle to apply rather than an act to duplicate; same complete gospel, but with the understanding that the cultures of first century Christianity cannot possibly be implemented into twenty-first century America. His argument is hard to refute when considering that Paul used the Old Testament continuously to build his doctrine but never once brought the cultural practices of say Moses into his letter to Galatia; matter of fact, he warned his readers of doing so. Never has this been brought more alive for me than during my stay in Africa. The missionary in the distant land has learned that the cultural influences of Christianity in the west are of little value to a potential gospel prospect in Senegal. The good news must be carried to them in their own culture. What is so amazing is that the gospel fits perfectly into every culture; we need not change cultures to see people changed, and when the gospel changes people everything else falls perfectly into place, and sometimes cultural practices remain without change. The practice of foot washing may be a good example for illustration. Only once in my life have I experienced this humbling act, and to be honest, as a child, I had no idea what my Sunday School teacher was doing. Today I am very grateful for his act of service because I know what he was trying to share with us, but to be honest, I think that in our culture there are a gazillion ways to demonstrate what Jesus wanted us to know from his act of service to his disciples, but exactly duplicating his labor is not one of them. In southern Senegal, where everyone walks everywhere, I can almost see the advantage of the foot washing example, but in America, where walking is only done for exercise and pleasure, it is borderline meaningless. We will do better to consider washing someone’s windshield, no? The question however still remains. How can I read the Bible and walk away with what I need to live faithfully before God when so much of it is oriented toward a culture very foreign to my own? Here, Mr. McKnight has given the reader an advantage not available to those who insist on either ignoring passages we don’t adhere to, or even for those who declare they do falsely. No one in western culture today that I know personally lives out the Bible as did those living when it was written. He shares that we merely travel into their time and grasp a principle that is relevant for every time. It is not feasible for us to do everything that the first century Christians did, but we can have the same heart they had, Jesus’ heart, and we can hear of what God is saying to us today, in our time, in our culture. This of course brings us full circle again to beg the same question, “What is merely cultural and what is to be duplicated?” We must admit this opens the door for some very contentious discussions. This entry was posted in Blue Parakeet and tagged Christianity, cultural, first century Christianity, foot washing, gospel never changes, Paul regarding women, That was then, the gospel fits perfectly into every culture, this is now, washing someone's windshield. Bookmark the permalink. Very thought provoking and looking forward to more. I’ve added the book to my wanted list. Hi our good friend! Prayers things are on the improve for you? I do hope you get to read this one… would love to hear your take. Blessings! Improve? Yes, in that I am hobbling a little more smoothly, but the specialist last week told me it is extremely unlikely I’ll get better than 90 degrees on my ankle, so walking evenly is out of the question. The swelling is likely to last another 6-12 months. 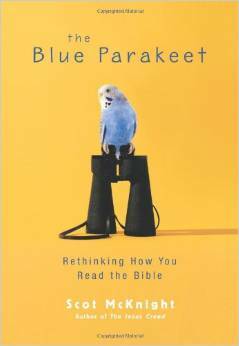 Yes, I have read and taught from “The Blue Parakeet.” I have also heard Dr. McKnight speak in person. You have written a great teaser…and I am hooked…and eagerly anticipating future posts on this subject. I wonder how often we are guilty of building the text Into a god instead of building a relationship with the God of the text? I am an unashamed quote collector….your post reminded me of something Thomas a Kempis wrote…”of what use is it to discourse learnedly on the Trinity, if you lack humility and therefore displease the Trinity? Lofty words do not make a man just or holy; but a good life makes him dear to God, I would far rather feel contrition than be able to define it. If you knew the whole Bible by heart, and all the teachings of the philosophers, how would this help you without the grace and love of God? That is a powerful quote to have in the reserve. I apologize that it seems there are many teasers leading to something more… there is. Blessings. Thanks for following Lessons by Heart! Praising Jesus who judges my heart – and not just my behavior! Thanks and blessings to you Tami. We appreciate your words. I would like to read further. I will be looking for it on Kindle and add it to my list. I hope you do get to read this one. Love to hear your take. I am working through a pretty big list right now but I hiope I can get to it this summer sometime. Thanks for sharing a review of this book. But until the author answers this question, from my perspective everything he says is to be ignored. If he clearly answers this question then a true debate on the merits of his teaching can begin. Lord bless you my friend. Thanks for sharing. Sorry for dragging my feet in sharing where the author goes, but in this book, I’m enjoying the trip there too much to hastily reveal. 🙂 I am very appreciative, as always, for your standing in with wisdom, so I hope you’ll hang around to ensure a faithful showing. At this stage I’m still trying to digest the question. I do think it is a question that has to be asked though because so much of what is written in Scripture is simply ignored or bypassed because we don’t want to tangle with inconsistencies like those mentioned, but also a whole herd more. Many blessings good friend. You should know! Thumbs up smiling Good stuff!!! I understand. I use them some but not like the girls that use them. Lol. Have a great day Brother!! !